This delicious lentil dahl is perfect for lazy kitchens. It simply requires heating antioxidant and anti-inflammatory rich spices with lentils and simmering in water for 20 minutes. Easy! Antioxidants mop up free radicals which help reduce signs of ageing in the body. There are so many wonderful variations of lentil dahl (it’s basically Indian style soup); often with garam masala or curry powder, onion and garlic. This one is even simpler because you won’t need to chop an onion or crush any garlic. Instead I’ve used mustard seeds, nigella and fenugreek seeds to create a warm and fragrant flavour. I started experimenting with onion and garlic free flavours because I have many clients who can’t tolerate them (they may have onion/garlic sensitivity or they might be following the Fodmap diet for IBS relief). If you have a slow-cooker, you can look forward to coming home to a warm, welcoming meal after work. Planning stews or hearty soups like this into your week is so fabulous because you'll have plenty of leftovers for either lunch or dinner the next day (and again the next day!) Simply double the ingredients if you want more servings. It freezes really well too, so I often make a double batch so that I have some healthy options ready to go for busy weeks. What herbs and spices do you like to use when making a lentil dahl? A note on measurements of the spices: a little guessing won't go amiss and won't make too much difference if you are slightly out. Serve over brown rice or as a soup. Brown rice is one of my favourite complex carbohydrates because it is so energising and easy on the digestive system for most. Hope you love this recipe as much as I do! For more food inspiration please head over to my Instagram and Facebook page or get in touch with me via the contact page or in the comments below. I'd love to hear from you! If you listened to my interview with Kaye Adams on BBC Radio Scotland recently you'll have heard me recommending how she should add almond butter to her morning porridge for protein. 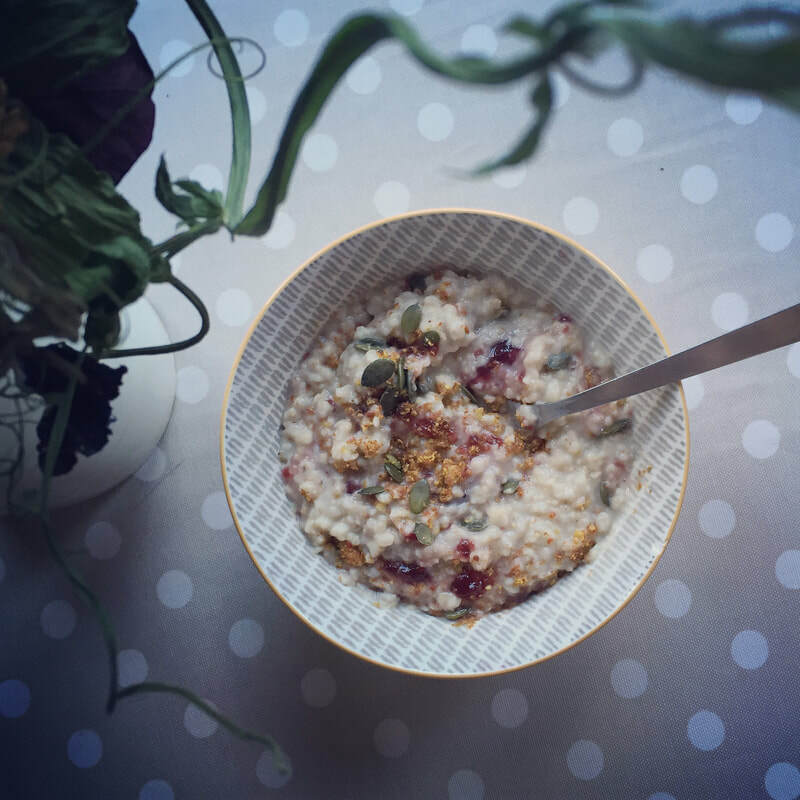 Here are a few other ways to pimp your porridge and stay fuller for longer. Swap the sugary, processed and over-priced 'two-minute porridge pots' for your own two-minute porridge pot filled with your favourite toppings. Porridge is nicest on the stove but if you're in a hurry these can be made in two minutes in the microwave and you won't pay a premium for the plastic packaging. Banana flavour: add a few slices of banana to the oats before cooking. Sprinkle with flaked almonds and coconut on serving. Porridge is just as easily made on the hob the old fashioned way! Not a fan of porridge? 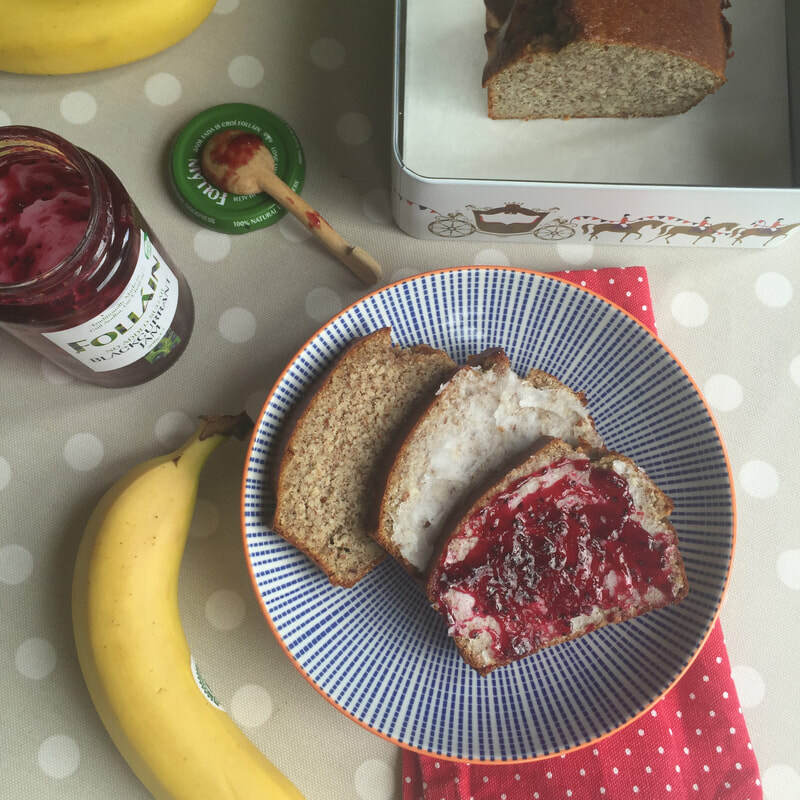 Try making this delicious, protein rich banana bread for breakfast instead. My favourite banana bread happens to be high protein and grain free. You’ll need a food processor or blender to grind the pecans into a flour-like consistency. This bread can be toasted if preferred and is delicious with some St. Dalfour or Follain (sugar free) jam or a little coconut butter. 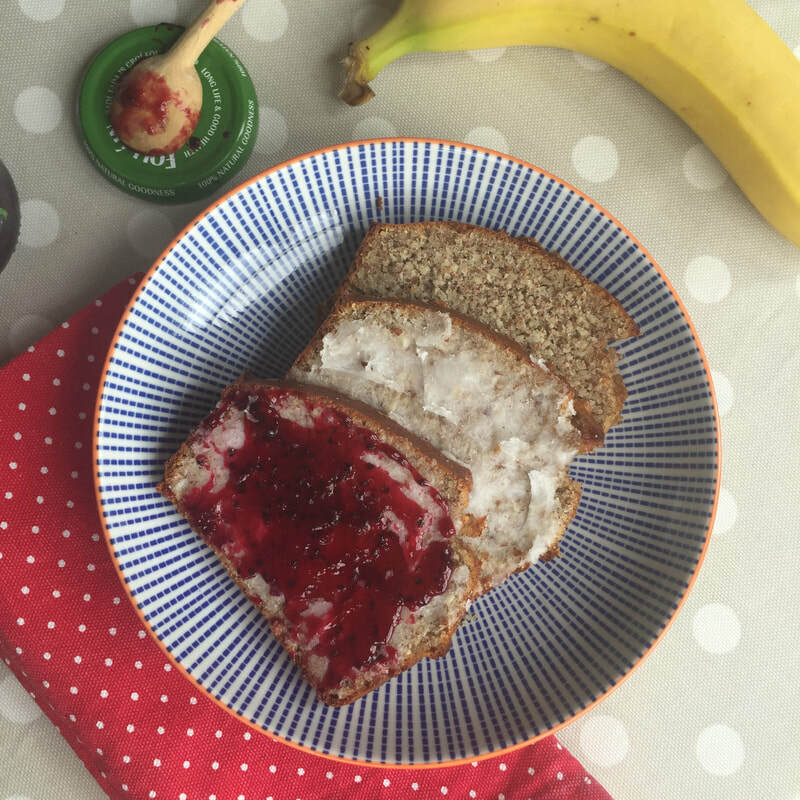 It's also delicious on its own for a breakfast on the go! 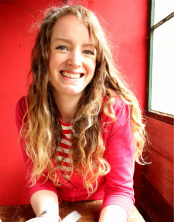 The recipe is adapted from a recipe by author and Nutritional Therapist, Christine Bailey. Once cooled you can cut it into slices and freeze individual slices for when you need them. Simply defrost in the toaster in a couple of minutes. This will also help prevent eating the entire loaf which is easily done, trust me!! Get my top 15 tips on successful meal planning here. Let me know if you try it. Would love to hear from you in the comments below. Find me on Instagram @stellar_health_mary for more meal ideas. ​This is my absolute favourite dish when I'm tired and just want to sit and watch Netflix. It particularly thrives in lazy kitchens because zero effort is required; roughly chopping three vegetables is about as taxing as it gets. You simply whack everything into a baking tray, toss in coconut oil and spices and 50 minutes later you are tucking into a delicious and nutritious healthy meal. *To make this vegetarian or vegan omit the chicken and reduce the paprika and cumin seeds to 1.5 tbsp. of each. Kale is a member of the cruciferous family, known for maintaining healthy hormone metabolism. Kale is an excellent source of folate (folic acid), often associated with fertility and making babies. Folate plays a large role in our mental and emotional state. It works with B6 and B12 to keep mood in balance thanks to its ability to metabolise homocysteine – think B for Brain. Quercetin, a phytonutrient is packed into red onions. It’s really useful during Sneezy Season thanks to it’s immune balancing and anti-inflammatory powers. Onions also offer fabulous amounts of inulin, a pre-biotic (non-digestible carbohydrate) which fuels the probiotics in our internal eco system, maintaining the health of our digestive system. Quinoa (pronounced “KEEN-wah”) really goes with everything; it is the perfect gluten free and wheat free substitute (good news for food intolerance/allergy sufferers) and has a delicious, slightly nutty flavour. It’s really satisfying, easy to digest and just so healthy! Give it centre stage on your shopping list! In this recipe I’ve glossed up the quinoa with a splash of coconut milk. If you’re not a fan of coconut a general rule of thumb for perfectly cooked quinoa is simply add one part grain to two parts liquid in a saucepan. Where will I find quinoa? You will find quinoa in any health food store and larger supermarkets in various forms: whole seeds (to prepare like a grain), quinoa flour (in combination with other flours for gluten free baking) and quinoa flakes (to make into a gluten free porridge). You need the whole seeds for this recipe. It is best to remove any leftover saponin compounds (quinoa's natural insect repellent) before you start cooking. Give the quinoa a quick rinse (30 seconds) under the tap in a fine-meshed sieve, gently rubbing it. If like me, you are usually tempted to skip this part (guilty-as when cooking brown rice), don’t! You will end up with a bitter and slightly soapy flavour and texture to this otherwise delicious food. Not to mention the many disappointed open mouths to feed at the dinner table! Now plonk the damp quinoa into a saucepan and dry fry it for five minutes. I really find this brings out quinoa’s natural nutty flavour. After dry frying it, add one can of ﻿full fat coconut milk﻿. Refil this can with stock (using 1.5 stock cubes) and add this too. If using chopped garlic, add this now also. Bring to the boil and then reduce to a simmer for 15-20. Give it a stir occasionally or just leave it to do its thing. You’ll know when it’s cooked because the grains become translucent and the white germ will partially detach itself, appearing like a spiralled tail. The coconut milk and stock get sucked up into the grains and you are left with this lovely, satisfying and moreish dish. While your quinoa is cooking away, prep this simple salad to serve it with. Two good handfuls of pumpkin seeds (dry toast them in a frying pan if you prefer a crunchier texture) You could also use sunflower seeds and sesame seeds. Mix everything in a bowl, squeeze over the lemon juice and drizzle with the oil. Crown with extra seeds. If you like quinoa, tell me your favourite dishes to pair it with in the comments below. Maybe it’s with stew, soups, atop salads, or something else entirely! Let’s hear it! Or, if you’ve got another delicious way to prepare quinoa, tell me about it. I really love hearing from you all. Drip feed your energy cells and avoid 3pm vending machine benders with these yummy, nutritional hits. You'll get joint-loving omega oils, 'complete' protein hemp and immune boosting goji berries. They are so so easy and literally ready in minutes. I like to keep mine in my gym bag and my locker at work so I know I won't go hungry. Perfect an hour or so before you hit the gym to keep your blood sugar and your energy levels balanced. Mash everything in a bowl with a fork. Roll into spheres and hide them in your fridge. Job done. Optional: sprinkle extra coconut on the outside so they look even more beautiful. 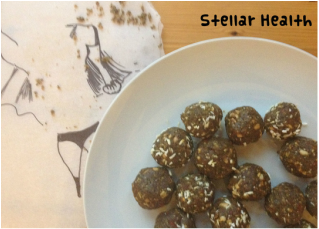 Ditch those dodgy energy bars and make a big batch of these instead!! You may think that bringing a vegetable to a dessert is a step too far but I promise this cake won’t taste of sweet potato! The mere whiff of the chocolaty gooiness will have your nostrils levitating and your pulse racing. Any hint of vegetable is instantly consigned to oblivion. Packed with beta-carotene, antioxidants and vitamin C, sweet potato rocks this dessert. The coconut flour makes an ideal substitute for gluten or grain flours (hello Paleo, hello coeliac). And you won’t beat this flour’s fibre content; it contains four to six times the amount of fibre in oat bran and twice as much fibre as wheat bran. (Goodbye haemorrhoids). Fire up the oven to 200 degrees celsius. Mix sweet potato, eggs, vanilla, honey and olive oil in a mixer. Add cocoa powder and mix then add coconut flour and give it a final mix together. Cook for 30-40 minutes at 200 degrees. Optional: melt 70-85% dark chocolate to drizzle over the top once cooled and serve with fresh raspberries. Yum. But wait! There’s more! 5 great reasons to ditch your dairy chocolate for the dark variety. Compounds that have a positive effect on mood. Phenylethylamine – the same chemical your brain makes when you fall in love…. 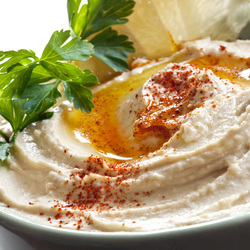 I absolutely love hummus. It’s so versatile and a great little stand by snack to have in the fridge for when I’m peckish. 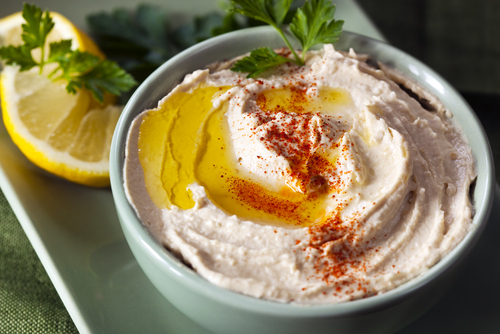 I love the creamy texture of shop bought hummus and I’ve finally mastered my technique at home to bring you the same deliciously smooth and creamy blend, spiked with a little garlic, cumin and lemony goodness. It’s hard not to eat this straight from the blender! My hummus is slightly lighter than shop bought varieties because I’ve added yoghurt and a lot less oil to make it perfectly smooth. If you are dairy intolerant simply substitute the yoghurt for tahini and use a bit more lemon juice instead (a crunchier consistency but still deelish). I’ve been enjoying it on oatcakes topped with salad and mackerel for lunch, as a dip for crudités and roasted veg as a snack and it also makes a creamy dressing for salad. I hope you love it as much as I do. It’s super healthy too, especially as chickpeas are such a great source of plant protein and fibre. Garlic is antibacterial and helps the body fight infection and cumin has powerful anti-inflammatory properties; it's simply bursting with flavour and nutritious goodness. Whizz the chickpeas, garlic, cumin, lemon rind and juice in the blender. Slowly add the olive oil while the blender is operating. Then add the yoghurt to the blender and season with freshly ground black pepper. Adapt the flavour to your taste by adding more oil or lemon juice. Spoon into a bowl and moisten the surface with a drizzle of olive oil. Lightly dust over some sweet paprika. If it lasts long enough to have left-overs, store in an air-tight container in the fridge. Mix the ingredients for the dressing together along with the chopped herbs. Add the chicken to the marinade. Turn to coat the chicken. Cook the chicken in batches on a heated grill until cooked through. Serve the chicken sliced ontop of the chickpea salad and drizzle with lemon juice. Yummy, right? If I'm feeling extra hungry or if I've run out of chicken, the salad tastes great on top of some hummus on an oatcake. Are you tired of the same old salad? Or is salad just not your thing? This delish salad may just convert you! It's a tasty, tangy, mouth-watering bowl of yum! I even crave this salad from time to time. A bit like a traditional Turkish Shepherd's salad my chickpea salad also uses lots of chopped up tomatoes, cucumber and fresh herbs as a base instead of the usual lettuce leaves. The great thing about this is you won't need to worry about your lunch going soggy as there are no leaves. The dressing is inspired by the traditional Moroccan chermoula dressing. Combine the ingredients for the dressing. Set aside. Quarter the cherry tomatoes, finely dice the cucumber, the onion, peppers and fresh herbs. Toss in a large salad bowl. Drizzle over the dressing and combine. Et voila! This will last in your refridgerator for at least 3 days and you'll get around 5 large portions. Lunches sorted! Parsley is a good source of folic acid, one of the most important B vitamins and a critical nutrient for proper cell division.